This Just In – in what has been described as one of the most hypocritical attacks in recent memory, disgraced Olympic sprinter and drug-cheat Ben Johnson today launched a blistering attack on Karl ‘Robbo’ Robinson’s handling of the Samir Caruthers PissGate story. 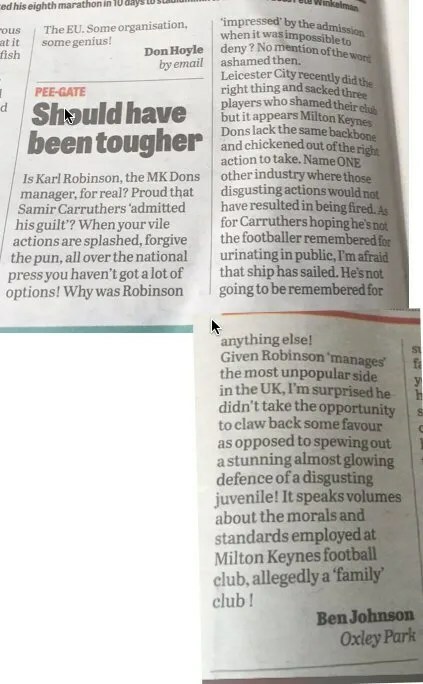 In a plea published in today’s Milton Keynes Citizen, Johnson claimed that the Dons were ‘the most unpopular side in the UK’, that Caruthers was a ‘Disgusting Juvenile’ and that the Dons were allegedly ‘a family club’. We’d also like to gently criticise the lack of consistency used – reference to both Milton Keynes Dons and Milton Keynes Football Club in the same article breaks all established rules of franchise bashing. More on this once we’ve established when he moved from Canada.